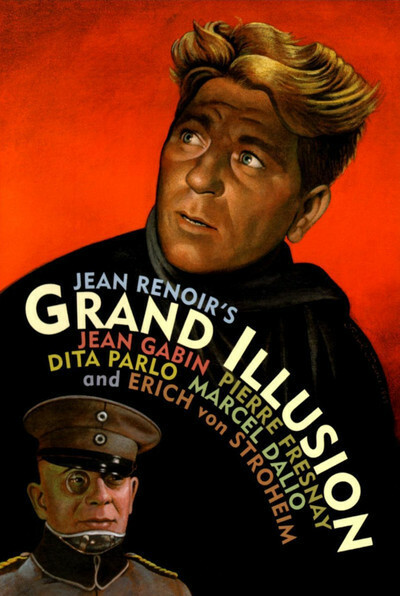 Apart from its other achievements, Jean Renoir's "Grand Illusion” influenced two famous later movie sequences. The digging of the escape tunnel in "The Great Escape" and the singing of the "Marseilles” to enrage the Germans in "Casablanca" can first be observed in Renoir's 1937 masterpiece. Even the details of the tunnel dig are the same--the way the prisoners hide the excavated dirt in their pants and shake it out on the parade ground during exercise. But if "Grand Illusion” had been merely a source of later inspiration, it wouldn't be on so many lists of great films. It's not a movie about a prison escape, nor is it jingoistic in its politics; it's a meditation on the collapse of the old order of European civilization. Perhaps that was always a sentimental upper-class illusion, the notion that gentlemen on both sides of the lines subscribed to the same code of behavior. Whatever it was, it died in the trenches of World War I. What the Frenchman knows and the German won't admit is that the new world belongs to commoners. It changed hands when the gentlemen of Europe declared war. And the "grand illusion” of Renoir's title is the notion that the upper classes somehow stand above war. The German cannot believe that his prisoners, whom he treats almost as guests, would try to escape. After all, they have given their word not to. The commandant is played by Erich von Stroheim, in one of the most famous of movie performances. Even many who have not seen the movie can identify stills of the wounded ace pilot von Rauffenstein, his body held rigid by a neck and back brace, his eye squinting through a monocle. De Boieldieu (Pierre Fresnay), from an old aristocratic family, is a pilot von Rauffenstein personally shot down earlier in the war. The other two major characters are also French prisoners: Marechal (Jean Gabin), a workingman, a member of the emerging proletariat, and Rosenthal (Marcel Dalio), a Jewish banker who has ironically purchased the chateau that de Boieldieu's family can no longer afford. The movie, filmed as the clouds of World War II were gathering, uses these characters to illustrate how the themes of the first war would tragically worsen in the second. So pointed was Renoir's message that when the Germans occupied France, “Grand Illusion” was one of the first things they seized. It was "Cinematic Public Enemy No. 1,” propaganda minister Joseph Goebbels announced, ordering the original negative seized. Its history since then would make a movie like "The Red Violin," as the print moved across borders in shadowy ways. For many years it was assumed that the negative was destroyed in a 1942 Allied air raid. But as Stuart Klawens reported in the Nation, it had already been singled out by a German film archivist named Frank Hensel, then a Nazi officer in Paris, who had it shipped to Berlin. When Renoir supervised the assembly of a “restored” print in the 1960s, nothing was known of this negative. He worked from the best available surviving theatrical prints. The result, the version that has been seen all over the world until now, was a little scratched and murky, and encumbered by clumsy subtitles. The original negative, meanwhile, was captured by Russians as they occupied Berlin and shipped to an archive in Moscow. In the mid-1960s, Klawens wrote, a Russian film archive and one in Toulouse, France, exchanged some prints, including the priceless "Grand Illusion.” But since many prints of the film existed and no one thought the original negative had survived, the negative waited for 30 years before being identified as a treasure. What that means is that the restored print of "Grand Illusion” now being shown around the country is the best seen since the movie's premiere. And new subtitles by Lenny Borger are much improved--"cleaner and more pointed,” says critic Stanley Kauffmann. This print looks and feels like a brand-new film. Here is a crisp print that underlines Renoir's visual style, his mastery of a subtly moving camera that allowed him to film extended passages without cutting. In the paintings of his father, Auguste Renoir, our eyes are led gently through the composition. In the films of the son, there is a quiet voluptuousness; the camera doesn't point or intrude, but glides. As "Grand Illusion” opens, we meet von Rauffenstein in the German officers' mess. Having shot down two French fliers, he issues orders: "If they are officers, invite them for lunch.” Marechal and de Boieldieu are later sent to a POW camp, where they meet Rosenthal, already a prisoner, and benefit from the boxes of food his family sends him; often they eat better than their captors. Here are the tunnel-digging sequences, and the famous talent show scene, where total silence falls as they regard a man costumed as a woman, for it has been so long since they've seen a real one. The tunnel digging is interrupted when all the prisoners are transferred. A few years pass, and now the three principal characters have been sent to Wintersborn, a fortress with high, unscalable walls. After a back wound ended his flying days, von Rauffenstein has volunteered to be commandant here as a way of remaining in service. He is strict but fair, still deceived by notions of class loyalty. The break from the fortress prison produces the touching deathbed farewell between De Boeldier and von Rauffenstein, which is the film's most touching scene, and then we join the workingman Marechal and the banker Rosenthal as they try to escape by walking cross-country through German territory. They're given shelter by a farm widow who sees security in Marechal, and perhaps Renoir is whispering that the true class connection across enemy lines is between the workers, not the rulers. Jean Renoir, born in 1894, is on any list of the half-dozen greatest filmmakers, and his "The Rules of the Game" (1939) is even more highly considered than "Grand Illusion.” He fought in World War I, then quickly returned to Paris and entered the movie business. In his best films observation and sympathy for the characters define every shot; there is hardly a camera decision made for pure effect, without thinking first of where best to stand to see the characters. Renoir moved to America in 1940, and made several Hollywood films, notably "The Southerner," with a screenplay by Faulkner, before going independent in the 1950s with "The River," based on Rumer Godden's Calcutta story. In a long retirement he was sought out by younger filmmakers and critics, who found him as sunny as a grandfather in one of his father's impressionist paintings. He died in 1979. He would have been much cheered to know that even then the pristine negative of "Grand Illusion” was waiting in Toulouse to be discovered.